A lot of fresh money entered Dalal Street in the past 18-24 months but the pool of investment-worthy stocks has actually shrunk, due to lower than expected economic growth and poor corporate earnings. Indicating polarisation in the stock market, the scrip of ITC, the country's largest maker of fast moving consumer goods (FMCG), is trading at an all-time high discount to smaller peers in the benchmark Nifty index of the National Stock Exchange. 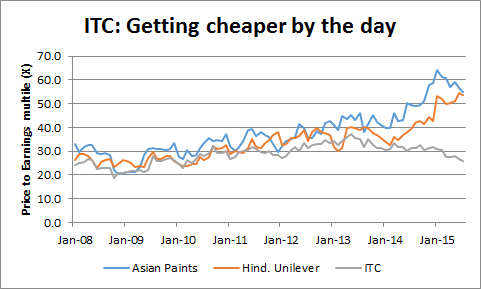 Hindustan Unilever (HUL) and Asian Paints are trading at more than twice the price to earnings multiple (P/E) of ITC. The tobacco to FMCG major is now trading at a 26x valuation ratio in the trailing 12 months. In comparison, HUL commands a valuation ratio of 53.5x, while Asian Paints has become one of the most expensive stocks in the index, with a P/E multiple of 55x. The valuation gap had opened in recent quarters. Earlier, the valuation of the companies used to move in line. Historically, ITC has always traded at a discount to its peers but it was never as large as now. For example, in January 2014, ITC was trading at 30.6 times its trailing 12-month earnings, around a 10 per cent discount to HUL's P/E multiple of 33.8x and a nearly 30 per cent discount to Asian Paints’ 39.7x. ITC’s lower valuation is due to the hangover of its slow-growing tobacco business and the losses it incurs on its fast-growing non-tobacco FMCG business. Beside, ITC has one the highest free-float (non-promoters’ holding) among peers, leading to more shares available for trade, a brake on a spike in valuations. ITC remains the largest (by revenue) and the most valuable consumer goods company in the market, followed by HUL and Asian Paints, respectively. The analysis is based on the month-end market capitalisation and trailing 12-month net profits of these three companies, beginning January 2008. The valuation gap is now at an eight-year high, as investors booked profits in ITC and shifted their money to peers, including HUL and Asian Paints. “The outlook has turned bearish on ITC as indirect taxes and regulations on cigarettes, its cash cow, tightened in the past few quarters. 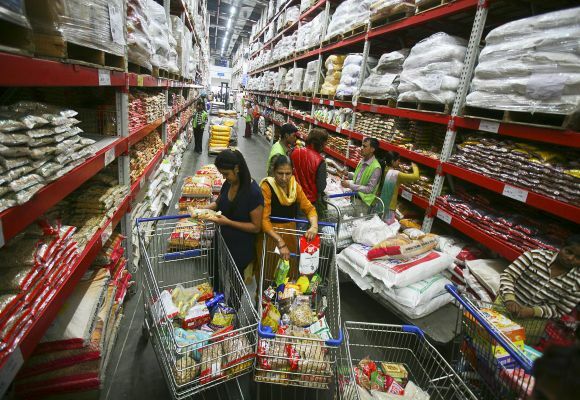 HUL and Asian Paints are pure-play consumer companies, face no such headwinds and command premium valuations,” says Devang Mehta, head of equity sales at Anand Rathi Financial Services. Some experts see it as a sign of market polarisation, where winners take all and losers are pushed to the margins. “The market is highly polarised and investors are willing to give record valuations for quality stocks that seem to offer better growth prospects,” says Nitin Jain, chief executive, global asset and wealth management, Edelweiss Capital. The polarisation is not unique to FMCG; it is also playing in the automobile, apparel, consumer durables and transportation sectors. “The valuation gap between market favourites and the rest has reached an all-time high and might seem insane to some. But, this is how markets operate,” adds Jain. For some, this is inevitable in a market where lots of money chase an ever-shrinking number of growth stories. “A lot of fresh money entered Dalal Street in the past 18-24 months but the pool of investment-worthy stocks has actually shrunk, due to lower than expected economic growth and poor corporate earnings. This has led to a situation where winners are treated like rock stars and losers are punished equally hard,” says G Chokkalingam, chief executive at Equinomics Research & Advisory. In the long term, however, there is not much to choose between the three companies. In the past five years (20 quarters) ending March 2015, ITC's net profit grew the fastest, followed by HUL and Asian Paints. Given this, the current gap in the valuation might sustain for quite a while, as most sectors and companies go through a growth and earnings cycle. This raises the downside for investors who continue to stick with winners and ignore the losers.